A Manufacturing Execution System (MES) is a system that manufacturers can use to measure and control critical production activities. Some of the benefits of MES solutions are increased traceability, productivity, and quality. Other functions served by MES solutions may include equipment tracking, product genealogy, labor tracking, inventory management, costing, electronic signature capture, defect and resolution monitoring, key performance indicator (KPI) monitoring and alarming, executive dashboards, and other various reporting solutions. Prior to the invention and implementation of MES, information technology tools could not provide real-time data that production managers require to make accurate and informed decisions. Critical MES functionality includes mapping customer orders to specific production runs as well as controlling and dispatching orders; a production schedule must be based on actual (rather than projected) information about labor, material, and machine productivity. MES systems allow for the definition and enforcement of production procedures and business rules, and automatically alert production personnel to deviations from production rules. The ability to provide an integrated quality management process provides real-time feedback and automatic alerts to positively affect the utilization of specific equipment, routes, operators, and material combinations for a particular work order or project. It is important to note that the term MES is held very loosely across different manufacturing industries such as semiconductor, process, food and beverage, and woodworking. There are idiosyncrasies of MES for each sector in manufacturing. 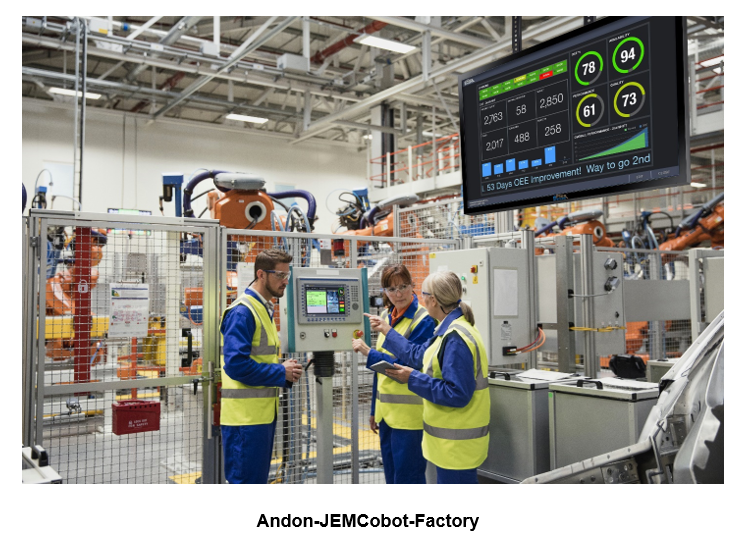 Manufacturing execution systems deliver information that enables the optimization of production activities from order launch to finished goods. Using current and accurate data, MES guides, initiates, responds to and reports on plant activities as they occur. The resulting rapid response to changing conditions, coupled with a focus on reducing non-value-added activities, drives effective plant operations and processes. MES provides mission-critical information about production activities across the enterprise and supply chain via bidirectional communications. MES has many parts and can be deployed on various scales. From simple WIP (work-in-progress) tracking to a complex solution integrated throughout an enterprise that monitors the following: controlling all resources used in the manufacturing process from cradle to grave as well as critically interfacing with other enterprise systems like Enterprise Resource and Planning Systems (ERP), Product Lifecycle Management (PLM), Supervisory, Control and Data Acquisition (SCADA) solutions, and Scheduling and Planning Systems (both long-term and short-term tactical). Increasingly more manufacturers are ETO (engineer-to-order), which requires that MES solutions are capable of a tight integration between projected (estimated) and actual costs; engineering and production management (purchasing, job costing); and, CAD/CAM and production. Ironically, despite the central and vital role an MES system most manufacturers currently work without an MES solution deferring to an MRP system and estimating on a one-by-one basis, using spreadsheets. There are significant limitations using time estimates extrapolated from previous and similar jobs Added limitations are incurred using an accounting package "altered" to suit manufacturing. ETO MES solutions must track parts and products that can dynamically adjust to Bills of Materials (BOMs), Bills of Labor, routings, costs, selling prices, and sizes. 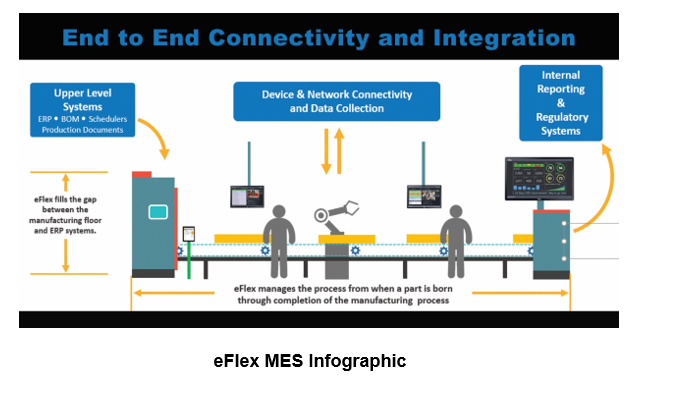 The most important characteristics manufacturers should consider in the selection of an MES system are suitability to the manufacturing environment - namely, customizable solutions and the ability to view the entire enterprise nature of the solution by bringing together islands of information. eFlex System's MES solutions are developed using the latest web-based technology. By combining innovative software designs with the right tech stack and architecture. This MES solution maximizes visibility and transparency in every aspect of the production process-from the station level on the plant floor, up to the Enterprise Resource Planning (ERP) system. Real-time data is captured throughout the entire production process. Analytics with Key Performance Indicators (KPIs) can be displayed on large overhead monitors, or on any PC or mobile device connected to the network. MES solutions must capture a significant amount of data from individual task cycle times to process images. This large "Big Data" repository allows plant leadership and operators to make data-driven decisions that improve quality and maximize production output. While not all manufacturing processes are the same, MES software solutions must have the capability to adapt to different manufacturing disciplines. Job Element Monitor (JEM) Paperless Work Instruction software can be used on a highly automated system, or a more basic manual system that relies on the operator for error proofing feedback. Flexibility is a key component to software applications whether ETO or repetitive manufacturing; every manufacturing plant has its own specific needs and requirements. MES solutions must help manufacturers leverage technology, reduce costs, improve quality, productivity, and efficiency. Solutions must be applied to many manufacturing industries including automotive, aerospace, industrial, heavy equipment, medical equipment, appliances, and more. MES solutions must be stored on one simple application interface. Randy Blaylock, VP of Sales for eFlex Systems, has over 30 years of consultative selling experience and has a well-established reputation as a top solution sales professional and team leader. He has many years of experience in engineered manufacturing and....... See More Details.